Harlen Bretz named this area of eastern Washington the Channeled Scablands. 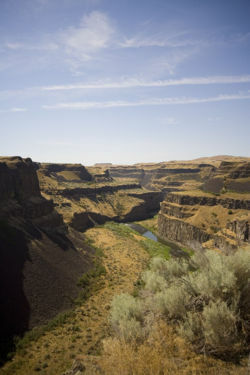 The idea that sites, such as the Palouse Falls Gorge or Dry Falls, were the results of floods was thought to be outrageous, and described by some as near lunacy since the area receives very little rainfall today. It took many decades for Harlen Bretz to finally receive the credit he deserved. 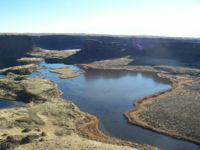 In fact, it was not until the area was observed from the air that many of the Scabland features were accepted as flood deposits, such as the giant ripples, which are up to 30 feet high and 250 feet apart. Almost fifty years following his original proposal, Harlen Bretz was hailed as a hero, and in 1979, at the age of 96, he was given geology's highest honor — the Penrose Medal, which rewards one researcher each year for exceptional contributions to geology. 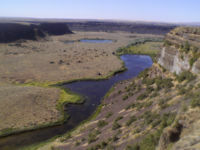 The Channeled Scablands have now been dedicated to Harlen Bretz, and it is commonly known that this area was destroyed by a massive flood catastrophe. It is believed that the flood was caused when a large glacial lake, called lake Missoula, broke through its natural dam and destroyed the majority of eastern Washington. During the Missoula flood stratified layers and canyons were formed rapidly. These features are common to our world and geologists are quick to interpret them as the result of slow and gradual processes because they cannot accept that the Biblical global flood was responsible. The Channeled Scablands illustrates the strong bias held by modern geologists against a catastrophic interpretation of the Earth's geology. Prior to the 19th century, most geologists were catastrophists who believed that the earth's fossiliferous rock was the result of the Biblical global flood. Around 1850 a major shift in thinking started to take hold, and the geological discipline began to develop into what it is today. As evolutionary theory began to spread, so did the idea that the earth was very old. Geologists began to interpret features, such as flood plains and canyons, based on current rates of deposition and erosion. Uniform rates and intensities were instead proposed as being the force behind the monumental quantities of flood sediment that covers the world. Uniformitarianism still governs the study of geology today. Modern geology has been largely founded upon the need by naturalists to explain our world independent of supernatural Biblical references such as the global flood. Even a suggestion that massive floods were involved with the formation of geologic features can subject a person to scorn and cause them to become ostracized by their peers. An example of this attitude is illustrated by the story of Harlen Bretz, who proposed in the 1920s that the topography of eastern Washington State was the result of a massive catastrophic flood. The geological community is threatened by the idea of catastrophic flooding because the most obvious interpretation of the fossil record is a global flood. Unfortunately geologists cannot correctly interpret the world's geology because today the community is comprised almost exclusively of naturalists. The Bible says there was a supernaturally-based global flood and animals are only alive due to an act of supernatural intervention. Contrary to this testimony, the deposits that cover the world must be explained by naturalists as though these animals survived the formation of the flood deposits naturally. Although the earth is completely covered in hundreds of feet of flood sediment, they must instead propose that it all accumulated so slowly and gradually that life was able to exist atop that material during its formation. If geologists cannot recognize that the Channeled Scablands were the result of a flood, how can they recognize the Biblical global flood? "In the end, the ‘truth’ of catastrophism did win, but it took more than 50 years to see the project through. And this was despite the fact that the event in question was relatively easy to document through field observations." E. K. Peters, No Stone Unturned: Reasoning About Rocks and Fossils, 1991, pp. 78 and 84. The Channeled Scablands of Eastern Washington Online book by the USGS. 1976. Mystery of the Megaflood by the NOVA TV series on PBS. Shaw J, Munro-Stasiuk M, Sawyer B, Beaney C, Lesemann J-E, Musacchio A, Rains B, Young RR. 1999. The Channeled Scabland: back to Bretz? Geology 27:605-608. Information sign reads... "A view of the Dry Falls as it might have looked about 13,000 years ago, during the last flood. This page was last modified on 7 January 2011, at 17:12.